Current Release: Somewhere in Between on Jazzland. Musical Recommendations: Alim Qasimov - time stands still when he sings. André Bratten – very talented young Norwegian electronica artist. 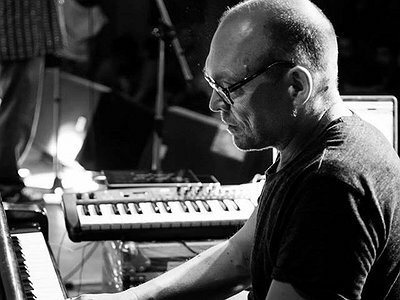 If you enjoyed this interview with Bugge Wesseltoft, you can follow his concert schedule, album releases and musings on his personal Facebook page. I started playing piano at the age of 2 (according to my father), then moved on to brass band and symphony orchestra (tuba and percussion) from the age of 7. An early influence was my father's music (jazz, soul, Jimmy Smith, Diana Ross, Stevie Wonder). I'd say my main instruments are the piano and various electronic sound sources. As I did not have a real piano between the age of 7-22, I moved over to organ, Fender Rhodes and my first synthesizer, a dx7. I bought myself a piano at the age of 22 and never left it since. Yet I'm drawn to the combined world of the stunning acoustic piano sound versus the possibilities of soundscapes coming from electronic sound sources, synts, effects, samples, algorithms, etc.. There are so many to thank for this, including all of my inspirations like Miles Davis, Jan Garbarek, Herbie Hancock, Stevie Wonder, Thomas Dolby, Don Cherry, Brian Eno etc etc.. Still, my main inspirations were the influences from working with Arild Andersen and Jon Christensen. They managed to create their own world and told me how I should find my own way in music, instead of trying to sound American or like ECM. As a performer you have to find your own voice, pulse and sound connected to your own environment. Firstly to become (still working on this) a strong and good musician, then to focus on finding “my own way” of interpreting music. Next was my decision to establish my own record label and release my own music. Very important step for me. In my opinion they work equally aside each other. I see a good improvisation just as much as a high quality piece of music as a written composition. In the end both a composition and a improvisation, are a variation of timbre, sounds and pulses over time. The challenge is to connect and reach a listener. To me personally, I see a live improvisation as a unique art form where the performer has the possibility to grab the energy in the moment and transfer it into music, as opposed to performing a written piece. Sound, space, time, energy are the essentials in a concert and will always work together. The strategy is to try to connect to “what's going on” in that moment. First, connect with yourself, then to your fellow musicians and last but very importantly, connect with the the listener. Together, you will be able to create unique and strong musical energy. That's very true I think. To perform and express musical energy you have to have a palette to work with (technique, sound, personality, understanding of energy). The size and your control over this palette will define you and your music. My kinds of material are my control over my sound sources and my ability to connect with “now”. I very much agree. The connection to you, other musicians and the listener is everything. It's the same whether you play solo or in a group. However, it can be even more difficult to connect in a solo performance, as you really have to split yourself into both a realtime analyser and a performer and composer. I clearly see globality via the Internet as the most interesting source for art development. The possibilities for inspirations and connections are simply fantastic and will change the world (have already). A “new idea” is always based on combing two or more existing ideas. Today one can sit (almost) anywhere in the world accessing information and mix them with your own ideas. Performing live is clearly most important for me. The chance you have to connect with someone in a concert situation is unique in every moment. A good live performance will be defined by the strength of connection we manage to create. The energy of this situation should also stay strong in a recording. They are related, obviously. However music is so (too) easily accessible. There will be music almost wherever you are, and I feel sometimes music is reduced to a sound used for shopping purposes. I am sometimes jealous of writers. As a reader you have to sit down and concentrate to take in what you read. Music is a wonderful world of contributing energy – you should use it for more than a background happysound! Take it in, dance, cry, love and think about it. I have nothing against promotion and music journalists! They are extremely important. I'm against cases where business obviously comes before a level of quality. I do have a dream to work more with visuals in an art/music live concert context. "As a performer you have to find your own voice, pulse and sound connected to your own environment."